As part of the exhibition Witnesses: Art and Canada’s Indian Residential Schools at the UBC Morris and Helen Belkin Art Gallery, artist Cathy Busby’s WE ARE SORRY 2013 is on view at the UBC Walter C. Koerner Library. This exhibition is a collaboration between the Morris and Helen Belkin Art Gallery and the Walter C. Koerner Library at The University of British Columbia, and is made possible with the generous support of the Audain Foundation. Art in the Library offers new perspectives on contemporary art by presenting art that questions our current perceptions about the world around us. As part of the exhibition Witnesses: Art and Canada’s Indian Residential Schools at the UBC Morris and Helen Belkin Art Gallery, artist Cathy Busby’s WE ARE SORRY 2013 is on view at the UBC Walter C. Koerner Library. In its entirety, WE ARE SORRY was first exhibited as a public artwork in Melbourne, Australia (2009 – 2013). 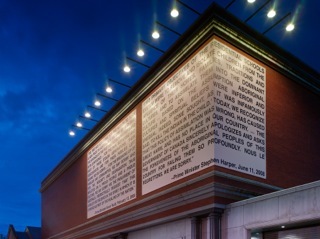 It was made up of artist Cathy Busby’s edited versions of the governments’ 2008 apologies to Indian Residential School Survivors in Canada and the Indigenous “Stolen Generations” in Australia, printed on vinyl and presented on the exterior of a power sub-station. The next year, by invitation of the Truth and Reconciliation Commission, Busby presented an indoor version at the Winnipeg Art Gallery (2010). WE ARE SORRY commemorated these historic apologies. Following a series of violations to the apology by the Canadian government, Busb y made B WE ARE SORRY 2013 as presented in Koerner Library is a further response to the erosion of the 2008 apologies, particularly the Canadian apology to Indian Residential School Survivors. For it, Busby cut a section from the vinyl of the Canadian apology of WE ARE SORRY in Melbourne. It is presented in the Koerner Library along with pieces of the remaining artwork for the taking by visitors. The reader is encouraged to learn more about these apologies, opposition to the subsequent budget cuts and related infringements by searching the sampling of links in the accompanying pamphlet. Also in this pamphlet is a listing of resources concerning Indian Residential Schools and the Truth and Reconciliation Commission available through UBC Libraries. Cathy Busby is a Canadian artist based in Halifax, NS. She has a BFA from the Nova Scotia College of Art and Design and has been exhibiting her work internationally over the past twenty years. Busby grew up in the suburbs of Toronto until 1974 when she had the opportunity to attend the Carcross Community Education Centre in the Yukon. This was an alternative school housed in the former Chooutla Indian Residential School and attended by both Settler and Indigenous students. Her Grade 11 year at Carcross was a turning point for Busby, marking the beginning of her development as an artist concerned with social justice. Busby received an MA in Media Studies and a PhD in Communication from Concordia University, Montreal and was a Fulbright Scholar at New York University. She is an Adjunct Professor of visual art in the UBC Department of Art History, Visual Art and Theory (2013-2014). This exhibition is a collaboration between the Morris and Helen Belkin Art Gallery and the Walter C. Koerner Library at The University of British Columbia, and is made possible with the generous support of the Audain Foundation. Art in the Library offers new perspectives on contemporary art by presenting art that questions our current perceptions about the world around us.